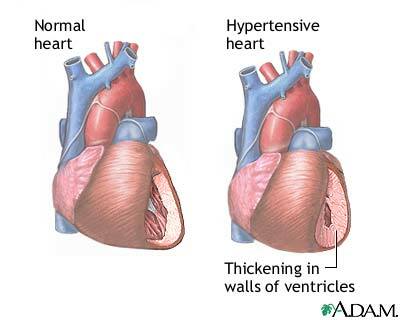 Hypertension: There are three major things central to hypertension. They include increased systemic vascular resistance, increased vascular stiffness and increased vascular responsiveness to stimuli. Hypertrophy: Cells increase in size to deal with increased workload. With increased vascular resistance and vascular stiffness in the circulation distal to the heart (aka increased cardiac afterload), the heart cells in the left ventricle get bigger, leading to LVH. LVH is a relatively early response to hypertension; it is even demonstrated on echocardiogram of children and adolescents with borderline hypertension. LVH may even begin before hypertension because the same factors (angiotensin II, norepinephrine, epinephrine, increased sympathetic drive, and endothelin) promoting both HTN and LVH . Why is LVH a problem? LVH is an increased in muscle mass and wall thickness but not ventricular volume. It also leads to decreased elasticity of the heart muscle. It impairs diastolic function, slows relaxation and delays filling. Complications can occur such as arrhythmia, ischemia, MI, and sudden cardiac arrest. These complications are likely due to two things. First, there is reduced density of capillaries in hypertrophied myocardium. Second, the enlarged muscle mass limits the ability of the coronary arteries to dilate and respond to decreased perfusion. The perfusion issues that we have just discussed can make the heart irritable and at risk of arrhythmia but there is also some remodeling of the electrical system of the heart in LVH. This could include prolongation of the action potential (i.e. leading to bundle branch block), altered repolarization and early action potentials (leading to VF, VT, torsades, or atrial fibrillation). What signs and symptoms might you see? Quick exhaustion with physical activity.